On an average obese person have greater energy expenditure than their thin counterparts due to the energy required to maintain an increased body mass. When compared to daily energy turnover, the amount of energy retained during growth and during the development of obesity is rather small, amounting to a difference of only a few percent between intake and expenditure. Because a positive energy balance can, in principle, be attributed to excessive intake or to reduced expenditure, there has been considerable interest in the possible significance of even small differences in metabolic efficiency for the development or the prevention of obesity. We have developed a 100% natural, holistic, eco-friendly and system friendly formula SKINNY SECRET to enhance the metabolism and suppressing the appetite. The herbal supplement is safer and effective for controlling obesity through metabolic regulation. The mechanism of action includes appetite suppression, visceral fat mobilization and burning for energy, control of further fat deposits, controlled calorie absorption from gut especially carbohydrates. This combination of above action is what we consider the answer to obesity. Alpha-glycosidase and Alpha-amylase enzymes found on the epithelium of small intestines as membrane bound. They catalyze the cleavage of glucose from disaccharides. These two enzymes are partially blocked by two herbal alkaloids. Hence a good amount of carbohydrates are not absorbed, this contributes to combat obesity by reduced calorie absorption. Also the HCA-inhibiting lipogenesis, increasing lipid oxidation, and reducing food intake. Skinny Secret relaxes blood vessel smooth muscles via increased cAMP synthesis, helping to reduce high blood pressure, by reducing resistance to blood flow. Congestive Heart Failure - as a therapeutic intervention in congestive heart failure Forskolin has been shown to activate the enzyme adenylate cyclase, which increases production of cyclic adenosine monophosphate (cAMP) in heart muscle cells (cardiac muscle). Epinephrine has a similar effect on increasing cAMP. Increased levels of cAMP in turn, increases the ability of the heart muscle to produce ATP, which is the energy required for heart muscle contraction and optimal force of muscle contraction with each beat (increased stroke volume). Forskolin also relaxes the artery wall, decreasing blood pressure and thus, pre-load stress on the heart muscle. All of these effects appear to be mediated via increased cAMP synthesis, which acts as a secondary messenger on various cellular processes that manifest the stated outcomes. Hypertension as mentioned, Forskolin relaxes blood vessel smooth muscles via increased cAMP synthesis, helping to reduce high blood pressure, by reducing resistance to blood flow. Platelet Function Forskolin antagonizes the action of platelet-activating factor (PAF) by interfering with the binding of PAF to receptor sites on cells. In turn, this reduces platelet stickiness as well as smooth muscle contraction of blood vessels and bronchiole air passageways. Once again, these effects are mediated through increased synthesis of cAMP. Recent evidence suggests that supplementation with Coleus Forskohliimay help to reduce body fat in overweight adults. As with other substances that increase cAMP (caffeine, adrenaline, ephedrine, epinephrine), Forskolin enhances the breakdown and release of fat from fat cells. The synthesis of cAMP in fat cells initiates a chain events that results in hydrolysis of stored triglycerides by hormone sensitive lipase enzyme, with the subsequent release of free fatty acids and glycerol from fat cells.8,9,10 Unlike ephedrine and other central nervous system stimulants, Forskolin does not stimulate the nervous system. Gymnemic acid in the formulation has also been found useful against obesity, according to recent reports. This is attributed to the ability of gymnemic acids to delay the glucose absorption in the blood. The atomic arrangement of gymnemic acid molecules is similar to that of glucose molecules. These molecules fill the receptor locations on the taste buds thereby preventing its activation by sugar molecules present in the food, thereby curbing the sugar craving. Similarly, Gymnemic acid molecules fill the receptor location in the absorptive external layers of the intestine thereby preventing the sugar molecules absorption by the intestine, which results in low blood sugar level. Visceral Lipase enzyme is targeted and hence fat from viscera is mobilized for burning to release energy. Citric acid cycle enzymes are affected negatively for gluco-neogenesis. Further fat formation from Acetyl coenzyme A is checked. In the same time energy is sufficient in the body as the fat is burning continually. Natural anti-oxidants, minerals and micro nutrients are supplemented for stomach and liver protection. The herbs in the supplement contain Pregnane Glycosides which are believed to block the activity of Citrate Lyase. By blocking this enzyme further formation of fat in the body is reduced. Again the herb blocks another enzyme called Malonyl Coenzyme A. By blocking this enzyme, fat formation is further blocked and the body is forced to burn its fat reserves. This accelerates the rate of fat loss by the body. The Pregnane Glycosides in the herb also inhibit the appetite centre of the hypothalamus. Such a combination of natural ingredients could bring very good therapeutic results in reducing both body weight and size. Transabdominal and mid arm circumference can be measured to monitored this effect within 30 days usage of SKINNY SECRET. Let's look at an example of a successful no-diet weight loss program. A 45-year-old woman complains that she has gradually put on 12 pounds over the past year. In the last month, she's faced a stressful work deadline and added another 4 pounds to her frame. This individual's goal is to lose the 16 pounds she has gained. Since her weight has been gradually increasing, she knows that she is consuming more calories than she is burning, especially with her sedentary job. She decides that a weight loss of 1 pound per week (equal to a deficit of about 3,500 calories, or cutting 500 calories per day) would be acceptable and would allow her to reach her goal in about four months. She decides to make some changes that will allow her to cut back an average of 250 calories per day. Skipping a large glass of sweetened iced tea will save about 200 calories. Substituting mineral water for the cola she regularly drinks during meetings can save another 150 calories. Foregoing her morning muffin snack (or eating only half a muffin) can also save 250 calories or more. To reach her goal of a 500-calorie-per-day savings, she adds some exercise. Getting up early for a 20-minute walk before work and adding a 10-minute walk during her lunch break add up to a half hour of walking per day, which can burn about 200 calories. On weekends, she plans to walk for 60 minutes one day and spend one hour gardening the next day for even greater calorie burning. If walking for 60 minutes is too much, two 30-minute walks one day would burn the same number of calories. Twice per week she plans to stop at the gym on the way home from work, even if only for a half hour of stationary cycling or swimming(each burning up to 250 calories). By making just some of the dietary cutbacks mentioned and starting some moderate exercise, this individual can easily "save" the 3,500 calories per week needed for a 1-pound weight loss, leading to a healthy rate of weight loss without extreme denial or deprivation. Furthermore, her changes in diet and lifestyle are small and gradual, modifications that she can maintain over time. The desire to lose weight must come from the individual. If you're truly ambivalent about making changes in your lifestyle or are doing this to please someone else, you're likely to fail. When making changes, decide what's right for your lifestyle. Your best friend's diet and exercise plan may be completely wrong for your habits and interests. The key is to find a system that works for you. Don't blame yourself if you aren't perfect. If you once fail at your attempt to curtail your overeating, it doesn't mean you are a failure at weight control and that you should just give up. Accept that you made a poor choice, but don't let that poor choice influence the rest of your plan. The same holds true with exercise. Skipping a few workouts doesn't mean you can't get back on track. Weight control does not involve making perfect choices all the time, rather it's about attempting to make good choices more often than poor ones. Avoid surroundings where you know you're tempted to make poor food choices. Everyone has a time when we're most likely to overeat, whether it's the morning coffee break or after-work gathering with friends. Try to plan other activities or distractions for those times, or plan in advance how you're going to handle them and stick to it. Surround yourself with people who support your efforts. Even our good friends can knowingly or unknowingly sabotage weight-loss attempts. Spend time with those people who will not pressure you to make poor food choices. Stock your pantry and refrigerator with healthy foods. Get rid of the high-calorie, low-nutrition snacks like chips and candy. But don't forget to have plenty of healthier options available as well, such as popcorn (hold the butter, try Parmesan cheese sprinkles), low-fat cheese and yogurt, fruit, instant cocoa without added sugar, sugar-free popsicles or puddings, or whatever appeals to you when you're hungry for a snack. Set small goals and focus on these rather than the "big picture." Decide where you want to be in a week or in a month, rather than focusing on the total amount of weight you'd like to lose. Obesity is a medical condition in which excess body fat has accumulated to the extent that it may have an adverse effect on health, leading to reduced life expectancy and increased health problems. Enhanced lifestyle due to the technology development has attributed “machine assisted life” that reduces calorie burning through muscular efficiency. Obesity is most commonly caused by a combination of excessive dietary calories and lack of physical activity. Obesity increases the likelihood of various diseases, particularly vascular endothelial disorders leading to cardio vascular accident, diabetes mellitus, fatty liver, hyperlipidemias, arterial hypertension, lower limb joint diseases (osteoarthritis), breathing difficulties during sleep and social depression. For best results, no food should be taken 30 minutes before or after taking SKINNY SECRET. First of all, I have to thank Skinny Secret MOST of all for helping me to walk without a cane. My knee joint was very damaged and I was in severe pain. All of this was due to the fact that I was so overweight. I couldn't walk freely at all without someone's help. My doctor told me that losing weight was the only way to help my knee because my current weight was putting too much pressure on the joint. I try to only use natural medicines for any ailment that I have. I have tried almost every natural formula on the internet but I have continuously been disappointmed. I was discussing my frustration with one of my friends and she told me about your product Skinny Secret. I was skeptical of course because at this point I had already wasted so much money and time on other products thatclaimed to work but did not. I took a chance only because my friend had lost so much weight on it and really believed in it. I am veryhappy that I took that chance. The results were unbelievable! I am proud to say that I have now lost a total of 90 lbs in only 5 months. The weight loss was gradual at first but still I was encouraged by it so I continued. I feel better than I have in a very long time thanks to you and your product. I feel lighter, more confident, energetic and I am now walking without a cane and need no assitance at all. Now I keep your product in my house at all times and take a very low dose for maintenance. I eat whatever I want and I don't gain weight! A million thanks to Skinny secret and your team on the site for being so supportive through this whole process. This product blew my mind! I have to tell you that it's the best weight loss remedy I have ever used. In contrast to other weight loss products, I don't feel hyper from it at all. I used "Skinny Secret" for only a month and already lost 15 lbs. I am so happy with it that I had to write to you and express my gratitude. On June 23rd of 2010 I was in an accident and fractured both my legs. I bedridden for almost 7 months. It was a very difficult thing for me because I am normally a very active person. I spent most of the time in bed, as I couldn't use my legs. All I could do was watch TV , read and talk on the phone. I did a tremendous amount of snacking with no activity. The result was me gainig a great deal of weight. I am 20 years old and I am 5'7. I ballonned up to almost 215 lbs! esulting put up my weight. I was miserable and felt there was nothing I could do about it. When my legs were finally healed enough for me to get out of bed and start getting active again, My Indian buddy suggested that I try some Yoga and some herbal supplements to lose the weight. The Yoga was just too difficult for me because my legs were not back to normal yet. I tried using over the counter weight loss drugs but the only result was me feeling jittery and a constant racing heart. I knew this could not be good for my health. I found Skinny Secret while surfing the internet for natural weight loss solutions. The testimonials on the website encouraged me to try Skinny Secret and I asked my Indian buddy to check it out. He was familiar with the Chavarcode family name and told me how well known you were in India for your Aryuvedic medicine. That was all I needed to feel confident in placing my first order. In the first month alone, I lost 15 lbs and I am still losing weight. I have no side effects at all . It has really been a pleasant surprise. I am writing a testimonial only because I really believe in your product and feel very comfortable recommending it. On the internet you see countless "remedies" for weight lost but this is a real deal. Skinny Secret is the safest and most effective product that I know for losing weight.I strongly recommend it. During my pregnancy, I gained a lot of weight . I ate whatever I wanted and didn't think twice about it. When I finally delivered my son by C-section, it was the happiest time in my life. But underneath it all, I just didn't feel good about myself because I couldn't take the weight off. I wasn't able to exercise because the C-section and I never wanted to go anywhere public with my husband because I couldn't fit into any of my clothes. It was a very hard time for me and I had lost a lot of confidence in myself. Finally, I resorted to taking weight loss pills from the pharmacy and also tried to control my diet. The pills were horrible. I was aggitated all the time and feeling very over stimulated. It even interfered with my interaction with the baby. I just could not use them anymore. I found Skinny Secret ion the internet just by chance. It was all natural and every testimoniall that I read said that it had no bad side effects. So I decided to give it a try although I wasn't very hopeful. In the first week on skinny Secret I lost 5 pounds right off the bat. It helpedto decrease my appetite with absolutely no aggitation at all. I was back to my old self again and losing weight at the same time. Now, I've been on Skinny Secret for almost 3 months and I just placed a new order. I have already lost a total of almost 50 pounds and I feel wonderful. I love Skinny Secret because I can eat whatever I want and still loss weight. The bonus is that is 100% natural. My weight loss has been fast and stable and I am excited to continue untill I reach my goal weight. I highly recommend Skinny secret for effective and safe weight loss for anyone and especially new Moms that feel like I felt. I have battled with my weight for over 8 years. It was a constant source of shame for me. I was never really happy with myself because of it. I heard about Skinny Secret from a friend who had lost a lot of weight on it. I had already tried many weight loss medications and even many herbal remedies. Some worked a bit but with too many side effects. Other didn't work at all. In the end , even when I did take some weight off, I would put it right back on. I lost all motivation and was just drained from trying everything with no success. I got to a point that I just accepted the fact that I was going to be overweight for the rest of my life. In the last few years, I spent thousands of dollars buying exercise equipment for my house. All of that money was wasted because I just couldn't take the weight off. Of course it is always good to exercise for Cardiovascular health etc but it was doing nothing for my weight. In the past five months using skinny secret, I have accomplished more of my goal than I have in all of these years.I am more than happy to recommend Skinny Secret to anyone who knows the pain of being overweightlose weight. 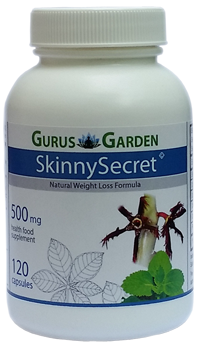 Thank you to Gurus Garden for creating Skinny Secret. This is the answer that I've been searching for and has changed my whole life. Coming out of college as a single mom with a large school loan debt, really took a toll on my personal life. I was totally overwhelmed and became severely depressed. I began over eating because of it and by my 24th birthday, I weighed just over 204 lbs. My pants size grew to a size 18-22. I thought I would never get back my shape again. It was a vicious cycle, the depression led to eating, the eating to weight gain and the weight gain to more depression. A friend told me that she had lost 21lbs in only three months on Skinny Secret. I hadn't seen her in some time and couldn'y believe the difference when I did. I went home and ordered it right away. The results for me have been life changing! I feel more energetic in my life . When I started noticing my weight dropping , I began to gain more confidence I still needed to overcome my binge eating habit but Skinny Secret helped me to do that. In total, I have lost 65 lbs. in only 6 months. I feel so good in so many ways. My wife and I are just finishing up with our 2rd bottle of the Skinny Secret that we purchased from your site. I just wanted to tell you how pleased we are with this product. There are no side effects, unlike others we have tried and it effectively curbs your appetite. We started losing weight naturally and with no effort. We both feel more energetic and confident about our appearance. I have lost 33lbs so far and my wife has lost 38lbs. We are placing an order for another 6 bottles today and my sister in law and her husband are placing thir first order also. They are very excited to start because they see what it has done for us. We love your product and we recommend it to others all the time now. Thank you so much. My name is Brooke and I am a journalist. I can't keep myself on a consistent daily schedule because of my crazy lifestyle. I put on a lot of weight over the last 2 years. My work clothes became very tight and my weight was starting to interfere with my job. I was in search of a natural herbal supplement to help me take the weight off . I was looking for something affordable that would get me back to my original size. That's when I found the Skinny Secret. I've been taking it for the last 4 months and I can't get over how much weight I've lost without any side effect. I have lost 32 pounds in four months. I like that it is has been gradual because I know it's healthier that way. I've gone down a few dress sizes and I feel fabulous! I am very thankful to Skinny Secret because it has been easy and effective. I started taking Skinny Secret a little over two weeks ago and I have already lost 8 pounds ! I haven't felt hungry and have had no side effects at all. It's been absolutely amazing! Thanks Skinny Secret!! I am the mother of 5 children and I am 43years old. I weighed 180lbs when I started taking Skinny Secret 2 months ago. My goal was to get down to 145 lbs. I can't believe I'm saying this butI have lost 20 lbs in 2 months!!! I feel so much more confident and I have more energy now to handle my children. I can finally fit into my "Thin Clothes" again! I am so thankful to Skinny Secret and Gurus garden for all the help. I love you guys! I would like to say thank you to Skinny Secret. I have been trying to lose weight for over 2 years without any success. I had a lot of extra fat around my midsection and stomach area and workouts were not doing anything for it. When I started taking the Skinny Secret in the beginning of January, my weight was 219 lbs. After 30 days, my weight went down to 198. Now it is February 24th and I'm at 184 lbs. This is very good progress for me being that I'm also diabetic. I have been diabetic for 18 years and have always needed large amounts of insulin to stabalize me, but ever since I've been on Skinny Secret I have only needed half of the amount of Insulin than I have needed before. I'm not getting the same ups and downs in blood sugar throughout the day. This is alll so amazing to me because I only took Skinny Secret to lose weight. I had no idea that it was also possible to improve my diabeted. Also, the fact that there are no side effects. Is unbelievable because I am hypersensitive to Meds. I am still taking my prescription medication but I take those alongside of Skinny Secret. I really feel better than I have in many years. I have already recommended Skinny Secret to my friends and co-workers because there are no ifs, ands or buts about it, this stuff is incredible! I ordered Skinny Secret after reading about it on your site. I've been taking it for a little over 3 weeks now and I've already lost 12 pounds. Within the first week of taking it ,I felt a lift in my energy level and my mood was better. I've noticed a huge difference in my metabolism as well. I've suffered from severe digestion problems my entire life, but ever since I started taking Skinny Secret, my system is handling food so much better. I haven't changed my diet other than including Skinny Secret in my daily routine. This has been the most beneficial dietary supplement I have ever taken. I am really so grateful to Skinny Secret. It has helped me tremendously. My target goal was to lose 15 pounds in one month. With the help of Skinny Secret I achieved my goal within five weeks with no problem at all. I was very cautious about trying any type of weight loss aid. While reading on your site I saw others saying that Skinny Secret was safe but I was very skeptical. In the end I decided to give it a try anyway. I have had no side effects of any kind and I feel more energetic. Skinny Secret worked very well for me. Im glad that I took a chance because this time it paid off. I would definitly recommend this product. It is well tolerated and no side effects noted. Bulky stools reported when more carbohydrates are taken, as disaccharides cleavage to its mono form is partially blocked. Initial few days mild blotting is rarely reported that disappears in short while. Side effects: - There are no known side effects.